May 25 is the anniversary of our marriage, yes, but also the anniversary of something very important and life-changing. A conception. It was the day I found out that I would be having something little to cuddle and take care of. A new generation for Bryan and me to raise and watch grow. A bundle of joy that would provide us a lifetime of laughter and love. Yes, May 25, 2008 was the day we conceived. I wrote this “tail” to document the “conception” and “birth” of our first “child” (yes, we’re those people who refer to their dog like that) shortly after we rescued him. 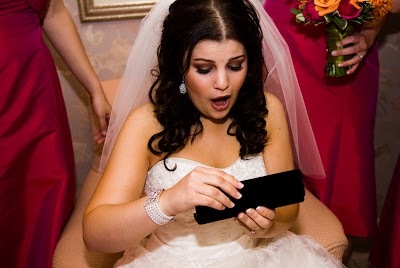 We thought it would be appropriate to re-blog this little story on our third wedding anniversary. Enjoy! The parents are proud and happy, though a little sleepless. Yes, that’s right, we have a new baby in the house and it’s our 8 to 12-month-old bundle of furry joy. We’d been looking for a dog pretty much since the wedding. Well, scratch that, I’VE been looking for a dog pretty much since my first dog passed away 10 years ago, but the time was never right; my parents didn’t want a new one, I went off to college, I moved into my friend’s house where she already had a dog and then I moved into my fiancee’s house and he hates dogs. Hated dogs. 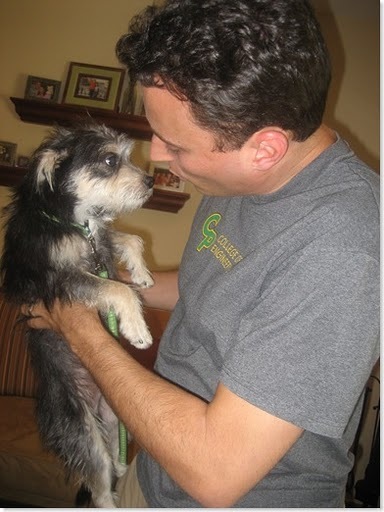 B knew how much a little doggie in my life would warm my heart but vowed never to assist in the parenting. He never grew up with a dog and didn’t understand why they are wonderful additions to an already-happy life. This had been a point of contention for us during our courtship and engagement time and I finally realized, reluctantly, that he could never be a changed man and if I ever had a dog, it would be mine and not ours. That made me sad, but a girl’s gotta chase her dreams like a dog chases his tail. Fast forward to the wedding day. 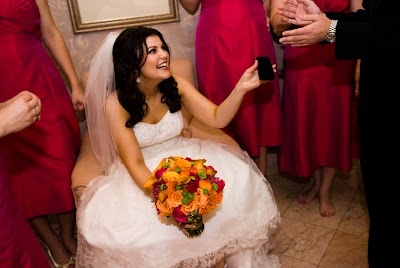 It came time for our Best of Honor to deliver the bride and groom gifts to the bride and groom. 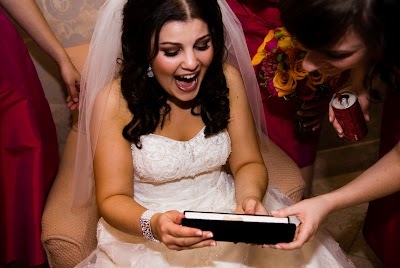 When the best man brought me a black velvet necklace box that appeared to have housed the pearl necklace I so wanted to wear on the wedding day, I was in for a bigger surprise. The best man handed me the box. 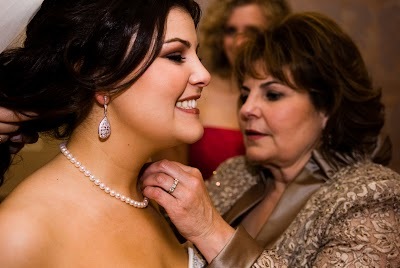 And I quickly opened it expecting to put on the pearls my dress was screaming to be friends with. 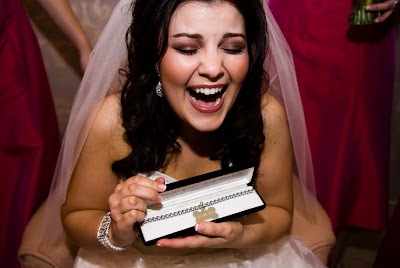 But instead, strewn along the inside of the box, was a silver choke chain that would complement a motorcycle bride much better than a country club bride. Was I supposed to WEAR this?! On the silver chain was a silver bone. Seriously? A BONE? My almost-husband thinks I’m a dog? 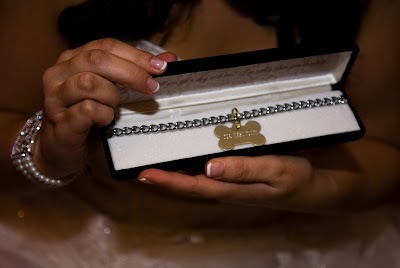 Oh wait, the bone has an engraving… “Our First Puppy” What? We don’t HAVE a puppy, smarty! Oh, but look! The lid of the box says something! There’s a note! It says: Alison, my love. Will you get a dog with me? I’m ready when you are. The waterworks started! I cried like a baby. My almost-husband, the love of my life, the stubborn, stubborn man who convinced himself he’d never be a pet owner, the handsome loving man who thought I was crazy for adoring 4-legged fur balls, MY almost-husband had changed. He thought deep down inside of himself and did some soul searching to realize that we could create a very special home together with a dog’s company. During our honeymoon, we frolicked along the beaches of Hawaii, brainstorming names for our pooch. No, we hadn’t gotten him yet, but we wanted to fantasize about all the joy he’d bring. 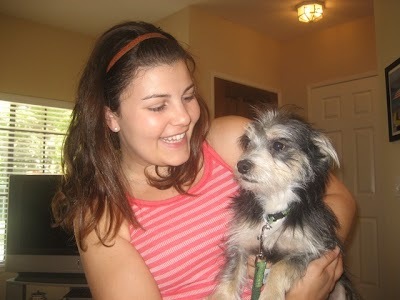 We decided we would definitely rescue a dog (no pet stores or breeders for us!) and it would not shed or drool, so that ruled out really big dogs. A small, lap dog that just wants to walk and be held would be perfect for us. We started the search when we got back to the mainland and found a lot of promising pups online, but the websites hadn’t been updated so they’d already been adopted – GREAT! (no really, that makes me so happy for them!!!) 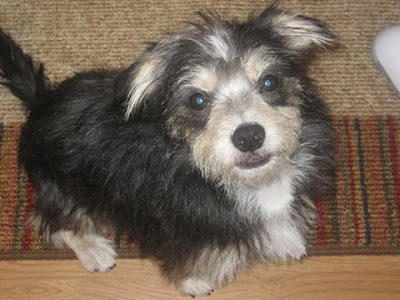 We found Beethoven online who was 7 weeks old a a terrier-lhasapoo mix. We met him and he was absolutely adorable. I could have taken him home that very night. We both enjoyed him so much but we had an appointment with another dog named Kiko who was 7 or 8 months old. We decided to meet Kiko first and then decide. Plus, we weren’t totally confident about raising something so fresh like Beethoven. We met the foster mom in Cerritos since she was coming from Anaheim and we were coming from Venice. Kiko was shy at first but he was really cute and seemed to have a nice personality. We spent three hours with him and basically grilled the foster mom about all the details of his temperament and lifestyle. I could see that B was bonding with him and seemed to be more excited about Kiko than he was when he met Beethoven. We ultimately decided that raising a 7-week old would not be as easy as raising an 8-month old so I took out the checkbook and Kiko nervously trotted to our car, unsure about what his new life would be. According to the rescue organization, Kiko was picked up by the animal shelter and was there for a while until the rescue organization saved him. He was in foster care for about 3 months until the day we met him. 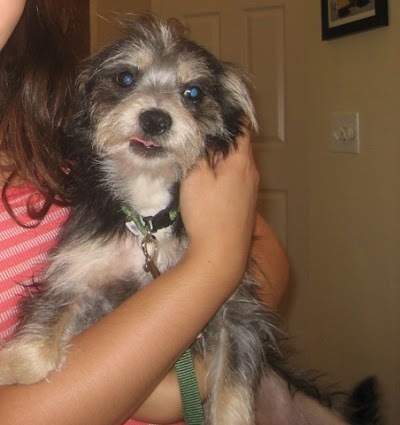 We renamed Kiko after the lead puppet character from one of our favorite musicals, Avenue Q! Princeton learned his name very quickly and has been responding quite well to it! We gave him a bath when we got home and while he didn’t really love it, he didn’t fight me and he just kind of let me do it. He smelled so much better after! Princeton is very sweet and really enjoys following us around the house and playing with us. He’s kind of a mama’s boy and follows my every move, which is cute, but I want him to be able to be independently happy since I won’t be here 24/7 with him. He rides well in the car but doesn’t walk so great. He loves to sniff every blade of grass and is very curious about every element on the sidewalk. The terrier in him is so obvious on our walks. Apparently, his foster mom didn’t walk him much so he’s not used to being on a leash. Thankfully, I’ve gotten into watching the genius, Cesar Millan on the Dog Whisperer and I’m trying to train him that I’m the pack leader and he needs to not walk ahead of me. It’s tough, but sometimes he does a good job and nothing makes me happier than praising him for being a good boy! Only problem is that Princeton isn’t eating and that worries me a little, but the vet said that it’s normal for a dog in a new environment to ignore his food. I wonder how long we should wait until it becomes a serious issue. Not to mention, it limits our opportunities to praise him for going potty outside (he’s done it 3 times and I’m surprised none of you readers could hear the potty party we threw on the spot!) since obviously he’s not producing, um, the “goods” for which to go potty since he’s not eating. Anyway, that’s our current challenge. That, and the fact that he keeps waking up at 6:30 a.m. and I immediately and groggily take him out for fear of him peeing and pooping in the house. Of course, he doesn’t actually GO on the way-too-early in the morning walk so … that’s that. Life with Princeton is fun. B and I enjoy parenting him despite the challenges and hope that he grows into a good and mature doggie. 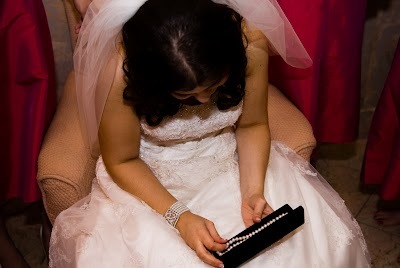 Oh, and p.s., my knight-in-shining armor almost-husband came through and also gifted me the pearls! After the dog excitement, the best man handed me another identical box and said quite casually in his witty way “oh, and you may want this, too.” I opened the box and sure enough, glistening in their glory, a stunning 16” strand of perfect pearls.